Home › White Papers › Announcing the release of the new book: Making the Complex Compelling—Creating High Performance Marketing in the Life Sciences, now available from Rockbench Press. 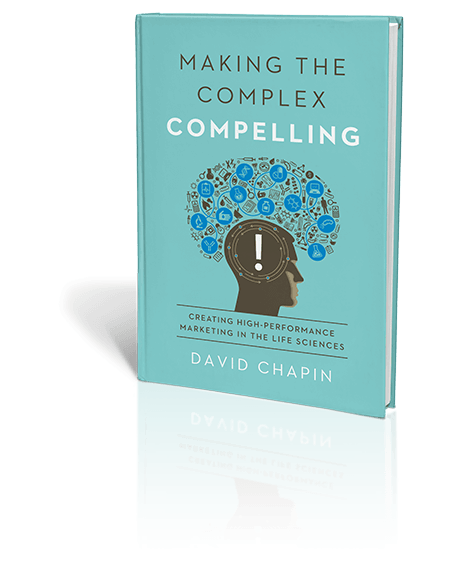 Announcing the release of the new book: Making the Complex Compelling—Creating High Performance Marketing in the Life Sciences, now available from Rockbench Press. This whitepaper is a free copy of Chapter 7: Positioning—Your Marketing DNA from Making the Complex Compelling—Creating High Performance Marketing in the Life Sciences, now available from Rockbench Publishing. This book provides detailed guidance on how to create high performance marketing that is focused specifically on the nature and needs of the life sciences marketplace. Making the Complex Compelling lays out a clear vision and step-by-step process for creating compelling marketing, with components that all work together and reinforce each other—from your unique value proposition, to an effective brand-story, to content marketing and marketing automation—all to drive engagement, interest, traffic, leads, and sales. Judging from the questions I’ve received and our web traffic over the years, positioning is a topic that fascinates many of you. In honor of the book’s release, this newsletter is a free copy of Chapter 7 from the book. This chapter is titled Positioning—Your Marketing DNA. It has been slightly edited and I hope this serves you well. In chapter six you saw how the marketing mechanism of action (MMOA) works to create a unique space in the minds of your audiences and that the first step in the process of creating this unique mind space—or image—is positioning. Successful positioning leads to a clear, unique image, one that will influence your audiences’ attitudes, beliefs, or behaviors (and, ultimately, spur them to some action). Like most marketing terms, position (or positioning) has multiple defini­tions. I’ll use this one: positioning is your organization’s conscious effort to select attributes that you want your audiences to associate exclusively with your offering. To understand how positioning works, consider a living cell. The cell’s DNA controls most of the cell’s activity. A cell’s DNA is locked inside the nucleus—effectively hidden from the rest of the cell. Its effects are only visi­ble through intermediary mechanisms, such as RNA and protein expression. Your position is essentially your marketing DNA.Your position is your marketing DNA. Unlike a cell, you actually can choose your marketing DNA by choosing your position. And given that the function of your position is to differ­entiate your brand from your competitors in ways that are important, believable, and compelling, the position you choose is very important. In fact, selecting an effective position is the fundamental starting point for your marketing efforts, and absolutely critical to the success of all your marketing initiatives. Though the articulation of your position (in your brand-story) and the subsequent expression of this brand-story (in your touchpoints) will be publicly visible, the exact position your organization selects should remain internal or private to your organization. This position is the controlling link between your organization’s strategic competitive advantage and its tactical marketing efforts, just as DNA is the controlling link between the cell’s over­all purpose and its protein expression, and therefore its metabolism. In this sense, your position is the core of your marketing plan. Your posi­tion should remain private—lest competitors attempt to thwart your plans. In more than two and a half decades of working with life science compa­nies, I’ve only had a few clients who provided a clear, concise, effective, robust positioning document at the start of an engagement. More often, clients provide one of two things, either their mission and vision statements (which are for public consumption and typically don’t marketing efforts. provide enough guidance to direct and support the marketing function in making distinguishing decisions) or an unfocused goal statement that is being inconsistently and ineffectively communicated through taglines, messaging, and brand-story. The lack of effective, robust positioning statements and the prevalence of poor substitutes is evidence of how difficult effective positioning is to accom­plish. Unfortunately, marketing activities that aren’t driven by a unique position are pretty much guaranteed to produce mediocre marketing results. Without a position that is unique, customers have no reason to see your offering as anything but a commodity.Without a position that is unique, customers have no reason to see your offering as anything but a commodity. Choosing a unique and defensible position, however, can lead to great success. For example, Forma was hired to help develop marketing tactics for a midsize service organization serving the clinical trial market. This is a highly commoditized sector; many competitors’ websites use language that sounds similar enough to seem identical. This organization wanted to increase its success in landing new business. Through careful examination of the organization’s business practices, Forma identified one area where its offering was indeed distinct. It provided a significant and tangible benefit for the organization’s customers. This was a marketer’s dream: there were strong, verifiable customer bene­fits from an offering that was unique in the market. This was a strong stra­tegic foundation. At a meeting with the customer’s entire team, everyone agreed that the organization should use this position as the foundation on which to build high-performance marketing efforts. The next steps were to articulate these benefits in the brand-story and then express this brand-story consistently across the entire ladder of lead generation. Before Forma was even able to take these steps, the CEO modified the company’s sales presentation to incorporate the new position. The very first time she used this new approach—the day after our meeting—she closed a sale with a new customer. What made this company’s new approach successful? Its corporate iden­tity didn’t change and the existing tactical expressions (the touchpoints) it was using were no different than its competitors’ tactics—every competitor had a website, every competitor went to the same trade shows, etc. What made the difference was a position that met the key criteria for effective positioning. The success of the company’s marketing efforts can clearly be traced to this unique position. It is important to take the time to identify your position, one that meets all the criteria for successful positioning. There are seven criteria for a successful position. All seven need to be pres­ent. Miss one or more and your marketing efforts will likely produce only mediocre results. Clear: Life science marketing must be based on a position that is clear and obvious. To achieve this, all claims must be examined as if they were being perceived by your audiences.To be successful, your position must be clearly stated and clearly understood. For example, it is common for early stage life science companies to spend a great deal of time promoting the scientific minutia that distinguishes their offering from others. In doing so, they often overlook the importance of speaking to the community of investors, a key audience for whom the science has to be simplified and clarified. To be successful, your position must be clearly stated and clearly understood. Firms that promote unique claims are perceived as different. The theory of supply and demand suggests that when something is unique, it can command a higher price, so positioning your firm or your offering as unique will ease the pressure on your profit margins (or allow you to increase your sales volume).Uniqueness is the most difficult criterion to fulfill. Uniqueness is the most difficult criterion to fulfill for service-oriented life science organizations. Regulatory agencies often monitor both the end results and the process by which these organizations develop and deliver their services, which leads to homogenization and commoditization. However, there are dozens of ways to be seen as unique. Examples include size of the organization, technology, area of expertise, history (e.g., “We invented this technology”), price, reputation, method of delivery, etc. How you are seen as unique is in many ways less important than the fact that you are seen as unique. Authentic: Your position must have a firm grounding in the truth. It must reflect what your firm actually can provide to your customers. Exaggerating claims may gain you the initial sale, but once customers realize that you can’t deliver on what you promised, they will not buy from you a second time. Nor will they refer you to anyone else. In fact, they may actively tell people not to work with you. When it comes to the relationship between a buyer and seller, trust must be ferociously protected. And nothing destroys a customer’s trust faster and more permanently than the discovery of exaggerated or false claims.When it comes to the relationship between a buyer and seller, trust must be ferociously protected. An example of a suspect claim: “Our employees are dedicated to produc­ing quality results.” This claim is not verifiable before purchase, so no one can tell whether it is authentic or not. Sustainable: Marketing campaigns have different durations. Some last decades, some disappear as soon as the next trade show closes its doors. Whether your specific marketing tactics last a long time or not, your position must be sustainable. A classic example of unsustainable marketing is the Ponzi scheme, where customers are promised a guaranteed return on their investment, without realizing the money they invest is actually used to provide returns to earlier customers. The marketing claims that you make are promises to your prospects: “If you buy from me, I promise you’ll get benefits one, two, and three.” Your customers will take these promises seriously, which means you must do like­wise. You must keep these promises—now and in the future. A promise you can’t fulfill is a promise you shouldn’t make.Your marketing claims are promises to your prospects; your promises must be sustainable. An example will drive this point home. Forma was working with a firm that had a broad offering, and as we were defining its specific claims, we discussed whether it wanted to be known as the firm with a broad offering, or as the firm with the broadest offering. The first option (“We’re the ones with a broad offering”) is an easier promise to keep, but one that is not unique or compelling. The second option (“We’re the ones with the broad­est offering”) is more unique and compelling, but represents a promise that is harder to keep. The distinction is subtle, but critically important to the future behavior of the organization. A commitment to having the broadest offering requires matching or exceeding competitive offerings, now and in the future. If you view your marketing claims as promises to your prospects (and is there really any other way to view them? ), then your promises must be sustainable. Important: Your position should ultimately be meaningful and important to the audiences. To be effective, your position should be composed of claims that are relevant and that address something they value. It is possible to have differences between two offerings that are not important to the audiences. A red-haired insurance salesman is one such example; being red haired is indeed a difference, but not one that is import­ant to the audiences.Your position must be based on what is truly important to the audiences. One company that Forma worked with insisted that a photograph of its product be front and center on all marketing materials. Customers weren’t buying this product because of the way it looked, but because of the results it provided. The appearance of the product was mundane and wasn’t important to the audiences. Highlighting an irrelevant feature (such as a product’s appearance) doesn’t help communicate the product’s real value to the audiences. Your position (and your market­ing communications) must be based on what is truly important to the audiences. Believable: Stating a marketing claim doesn’t ensure that prospects will perceive it to be true, particularly if they cannot verify your claim before they purchase. Claims such as, “We have high quality,” “We provide reliable service,” or even “We have the best people in the sector” are actually quite difficult to verify before purchase. Consequently, your audiences will tend to discount these claims, even if they happen to be true.A position that is not believable will make it harder for you to establish an effective image in the minds of your audiences. If your claim can’t be verified in advance, then using independent reviewers, statistical summaries, or testimonials can be a reasonable way to demonstrate the believability of your claims. Without these methods of verification, your claim will arouse suspicion among your more skeptical (or experienced) prospects. A position that is not believable will make it harder for you to establish an effective image in the minds of your audiences. Compelling: The goal of your position is to create a unique image in the minds of your audiences—which will give you the opportunity to influ­ence their attitudes, change their beliefs, or motivate them to action. Your position needs to clarify why your brand exists and how it will help buyers achieve their goals.Your position needs to clarify why your brand exists and how it will help buyers achieve their goals. There are many ways to motivate people. There are negative ways, such as fear, envy, and greed, and positive ways, such as altruism. Claims such as “50 percent off ” or “free shipping” can motivate the audiences through cost savings. Claims such as “money-back guarantee” can motivate the audiences through reassurance. All these claims might be motivational, depending upon the attributes of the audience you are trying to reach. It’s not enough for your position to meet one criterion. It must meet all of them. A position that is important to your audiences but not unique or believable will not be as effective as one that meets all seven crite­ria: clear, unique, authentic, sustainable, important, believable, and compelling. It is important to view these seven criteria through the eyes of the audiences. In other words, you might believe your position is clear, but that doesn’t really matter—your audiences must find your position clear. Jeff Bezos (of Amazon) is famous for bringing an empty chair into meet­ings to represent the customer. Understanding your audience is crucial when creating high-performance marketing, which is why market research can be so informative to determine what the audience finds clear, unique, authentic, sustainable, important, believable, and compelling. To be effective, the MMOA relies on an effective position, one that meets these seven criteria. There are several points that you should understand about your position before proceeding further. First, defining your position is more useful for outbound marketing than it is for inbound inquiries. Outbound marketing is typically designed to reinforce a particular image in the minds of the audiences: “We can help you with this type of problem.” Outbound marketing is interpreted by the audiences as more of a statement than as a question. In contrast, inbound inquiries—such as “Can you help me with this problem I’m having?”—are often the start of a dialogue.Your chosen position will be narrower than the scope of your entire offering. Second, outbound statements must be simple and condensed. Your audience isn’t paying much attention, so your communications must be tightly focused. You must distill your communications to focus on the most important point: your uniqueness. There simply isn’t room to include everything you offer. In other words, an effective posi­tion will often be narrower than the scope of your entire offering. Your position does not need to, nor can it effectively, encompass your entire offering. What makes you unique will be narrower than every service or product you might possibly offer. One common way to define your position is to focus on a subset of your offering. Major brands take this approach quite frequently. For example, car companies typically make a wide range of cars, including luxury cars, sports cars, family cars, and econ­omy cars. But their position in the market is often defined quite narrowly. They will focus on performance, safety, or luxury, but not all three. Trying to create an image that covers all three attributes would be horribly expensive, and confusing to the audiences, who might not understand that any single car can represent all three attributes. Your chosen position will be the basis for the creation of an image in the minds of the audiences. As such, it can be, and probably will be, narrower than the scope of your entire offering. Mergers and acquisitions are the prime examples of this point. The new, combined organization has a very wide offering, but it must distill this offering into a single position. This posi­tion must meet the seven criteria. Your position must meet all seven criteria, but of these seven the most important one is uniqueness. Ironically, this is the one that life science companies (due in part to regulatory requirements) have the most trouble accomplishing. To avoid the profit-killing consequences of commoditization, your life science offering must be unique—or at least perceived as unique. Ideally, no competitor should be able to claim it is offering anything like it. You might have to define your offering very narrowly to achieve the goal of true unique­ness, but if you are not seen as unique, you’ll be seen as a commodity.Your position will be stronger if it is actually unique, but that is not always possible, particularly in a regulated environment. Through the unique benefits that your product or service delivers. Through the reasons to believe that you provide to demonstrate why your offering is the best choice. Your position will be stronger if the benefits your product or service deliv­ers are actually unique, but that is not always possible, particularly in a regulated environment. In that case, the uniqueness of your position could be derived from a combination of factors, such as addressing a particular market and a particular set of reasons to believe. In Forma’s experience, the most difficult part of positioning for life science companies is ensuring that your benefits are truly unique. The following five-step exercise can help you better understand the impor­tance, and the difficulty, of defining unique benefits. It can be very helpful to do this exercise in a group. Gather together indi­viduals representing different functions within your organization, such as business development, marketing, or operations, and make your way through the following steps. Get those people in a room and grab a pad of paper and a pencil. Step One: Create a list of all the benefits that a customer receives when buying a product or service from you, no matter how large or small. It is important to be both as specific and as comprehensive as possible when creating this list. Step Two: Divide the list of benefits into two categories: those that are veri­fiable before purchase by a prospect, and those that are not verifiable before purchase by a prospect. For example, the cost of your product or service, the speed of operation, and the accuracy of the results are some examples of benefits that should be easy for prospects to verify before purchase. Benefits that might be diffi­cult to verify independently before purchase include the quality of a product or service, the status a customer may acquire by making a purchase, the response time to inquiries to the support desk, or the total amount of expe­rience possessed by a group of employees. All of these things may be more difficult, if not impossible, for a prospect to verify before purchase. Step Three: Remove from both lists all those benefits that are also avail­able from your competitors. To get this information, you may need to spend some time researching your competitors’ offerings. Once you have a clear understanding of the benefits available from your competition, review the lists of your own bene­fits and strike from your lists those that your competitors also offer. Through my experience, I have found that it is very hard for companies to be brutally honest at this stage. Yet identifying the benefits that make you unique is the entire point of this exercise, so I urge you to approach this step from another point of view: as if you were a prospect. Better yet, put yourself in the shoes of all those prospects that thought about buying your products or services but didn’t. From their point of view, look at the lists of benefits. Which benefits are truly available from both you and your competitors? Strike those from the lists. What will be left? Two lists of unique benefits—benefits that are avail­able only from your organization. One list will be of unique benefits that are verifiable before purchase; the other list will be of unique benefits that are difficult or impossible to verify before purchase. Step Four: Start with the list of benefits that are verifiable before purchase. Is anything left on the list? If not, you’re not alone. For companies selling services in the preclinical and clinical sectors, the answer is frequently no. For companies selling products in the discovery sector, the answer can be yes, and those unique benefits are frequently tied to the products’ technical specifications or performance metrics. However, if it turns out there is nothing left on the list of benefits veri­fiable before purchase, this situation demands serious attention! Without unique benefits to offer your prospects, your offering is a commodity. It is hard to imagine a worse situation for a marketer. But wait, what about the list of benefits that are not verifiable before purchase? Don’t these benefits prevent your offering from being seen as a commodity? The answer is a strong maybe or a weak yes—depending upon your optimism. The fact that these benefits are not verifiable before purchase will make any marketing claims related to these benefits suspect.Simply stating a claim doesn’t make that claim true. That’s because simply stating a claim doesn’t make that claim true. (Remember the tragedy of undifferentiated claims from chapter four?) Pros­pects will judge all your claims in light of their verifiability. They may still choose to believe those unverifiable claims, but doing so will require a leap of faith on their part. Let’s look at a retail example, one from a low-trust purchasing environ­ment. The name (and implied claim) “Honest Dave’s Used Cars” won’t guar­antee that the customers see the dealer as honest. That is, stating the claim doesn’t make the claim true. Claims have to pass consumers’ “smell test”— and the best way to accomplish this is to make claims that are verifiable before purchase. And honesty, like quality, is one attribute that is very diffi­cult to verify before purchase. While the many sectors associated with the life sciences are higher-trust environments than the typical used car lot, the fact remains that benefits (claims) that are not verifiable before purchase don’t have the same market­ing power as those that are. In some cases, it is possible to provide metrics that substantiate these claims. For example, the claim “Our manufacturing facility has never received a warning notice of any kind from any regulatory body, such as the FDA” could be used as a way to substantiate a claim of quality or attention to detail. A survey of past purchasers could provide metrics that substantiate a claim of reliability. But without some type of substantiating metrics, the claims listed above are typically unverifiable before purchase and therefore ineffective. Step Five: If there are items that remain on the list, order them according to their importance to a prospect’s purchase decision. While the cup of Guatemalan coffee that I mentioned may be a unique benefit, it probably doesn’t influence your prospect’s purchase decision very much, so it should be put low on the list. What if There Are No Unique Benefits? If you have completed the steps above, and you have no unique benefits, or if your unique benefits are not actually that important to the purchase decision (like the Guatemalan coffee example), you have three choices. Each choice will have its own challenges and rewards. Choice One: Go back to the drawing board. Look at your original list of unique benefits. It may be that you overlooked some benefits, or that you can combine several existing benefits into a single unique benefit (“While some competitors may offer benefit A, and some others may offer benefit B, we are the only company that offers both benefits A and B”). Choice Two: See if you can create some unique benefits by identifying some “white space” in the marketplace where you will have few competi­tors. What do your customers want that no competitor is currently offering? Market research can often provide hints to point you in the right direction. If you have struggled to identify unique benefits and your list is still blank, you will have to accept the fact that the differences between you and your competitors are not that significant. In this case, you will have to accept that the commoditization forces at work in the sector are too steep to overcome and compete on price or speed of delivery or some other factor that isn’t very differentiating. The obvious distastefulness of this option points to the importance of unique benefits and why it is well worth looking very hard to identify them. Choice Three: You can manufacture some uniqueness. If your list of unique benefits is empty, then you will not be able to find and highlight the uniqueness in your position. This is common among large, service-oriented companies (like large clinical research organizations). In this case, you can create uniqueness in the mind of the customer by using your brand-story to help draw distinctions between you and your competitors. There actually are many other sectors where the offering is almost iden­tical; for example, fast-food restaurants, soft drinks, and large CROs. Some sectors are good at creating uniqueness in the minds of their customers. Most people do not have trouble distinguishing between the brand-stories of Coke and Pepsi or between McDonald’s and Burger King, despite the similarities in their products. In these instances, a clear difference in the brand-story has been translated by the customer into a perceived difference between the two offerings. One disadvantage of this approach is that you will have to work harder and spend more money than if you had authentic, unique differentiators. Also, for technically minded audiences, this approach can feel like the most “soft and squishy” aspect of marketing, so it can be difficult for many techni­cally trained people to understand and manage. If you find yourself in this situation, you may be interested in examin­ing the subject of brand archetypes—an effective and systematic method for managing the meaning in your brand-story. We’ll cover this more in chapter 10. Choice three demands different marketing strategies and tactics than choices one and two. In choice three, there are no unique benefits; in choices one and two, you are able to identify truly unique benefits that are verifiable before purchase. Typically, real-world situations do not neatly fit into these extremes. For example, it will rarely be the case that you will have such strong unique benefits that you will have no need to rely on your brand-story. It is also rare to have absolutely no unique benefits and have to rely completely on your brand-story to create a distinct image.Deciding what makes your offering truly unique will allow you to differenti­ate your offering. Regardless of the approach, it’s important to acknowledge that defining a position that meets all seven criteria (clear, unique, authentic, sustainable, important, believable, and compelling) is the hardest strategic work in all of marketing. It is also the most important: deciding what makes your offering truly unique and embedding this into a position will allow you to differenti­ate your offering from all others. When life science companies enter new markets or introduce a new offer­ing, it is rare for the creation of a marketing strategy to get much attention. Instead, the focus tends to be on sales or the execution of key marketing tactics. While this may be practical, it often leads to false starts, mixed messages, and the unintentional establishment of a position that does not align with the best long-term interest of the organization. This is a waste of resources. To be successful, life science organizations need to create a clear, effective marketing framework from the beginning, and ensure that all subsequent marketing efforts reinforce it. Take the time to establish your organization’s position, ensure that it meets the seven key criteria, and then hold to it. While the tactics used to convey aspects of your position will vary over time, the position should stay firm.Take the time to establish your organization’s position and then hold to it. Organizations that offer life science products will often focus their posi­tions around their products and specifications (so-called speeds and feeds). Organizations that offer life science services often have a more difficult time defining their positions precisely. Without technical specifications to rely on, more work and insight may be required to pinpoint the most effec­tive position. Now that you (hopefully) understand the importance of positioning (the “why”), in the next chapter I’ll examine what’s involved in the construction of your positioning statement (the “how”). For those that are interested in reading further, the book is available here. Here is the table of contents from Making the Complex Compelling—Creating High Performance Marketing in the Life Sciences, available now from Rockbench Publishing.